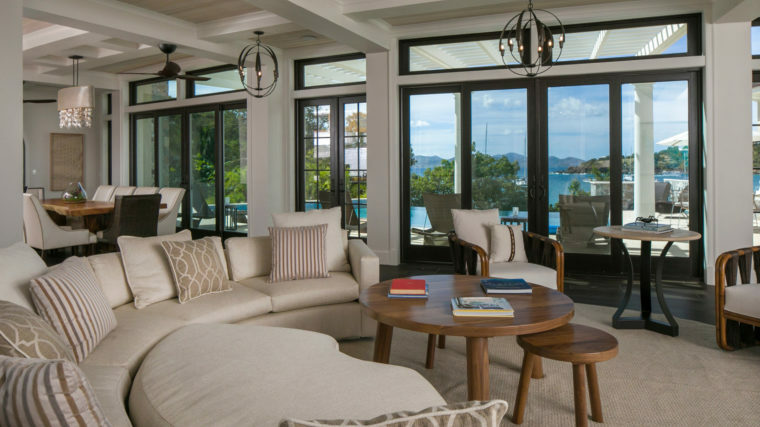 Morgante Wilson Architects designed this island home on a radius so rooms flow together. 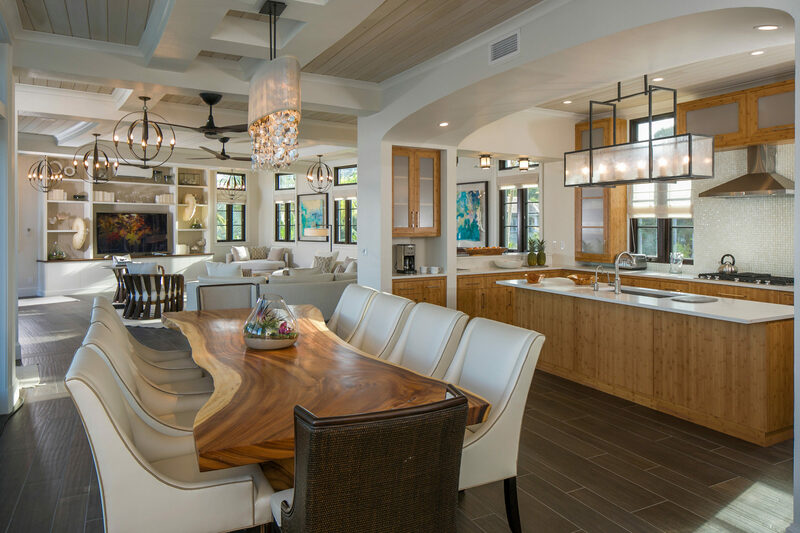 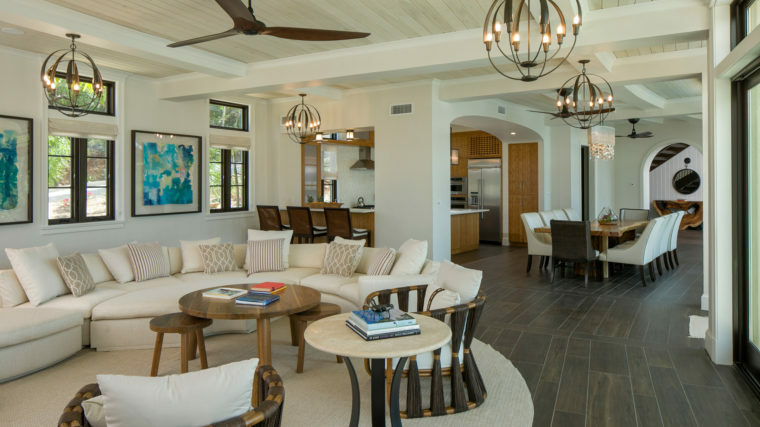 Concentric ceiling beams echo the curve in this view of the Dining Room, Kitchen and Family Room. 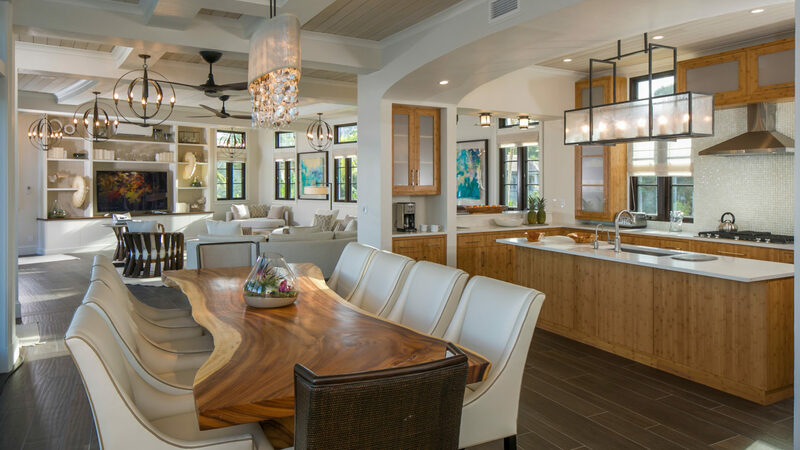 The organic live edge dining table from Phillips Collection speaks to that curvilinear direction. 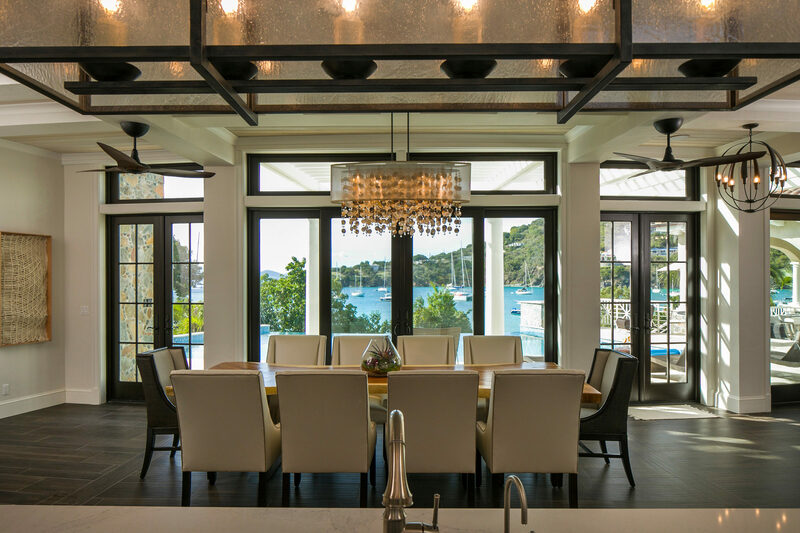 The airy environment in this island home is acheived with a pickled cypress ceiling and white beams through-out. 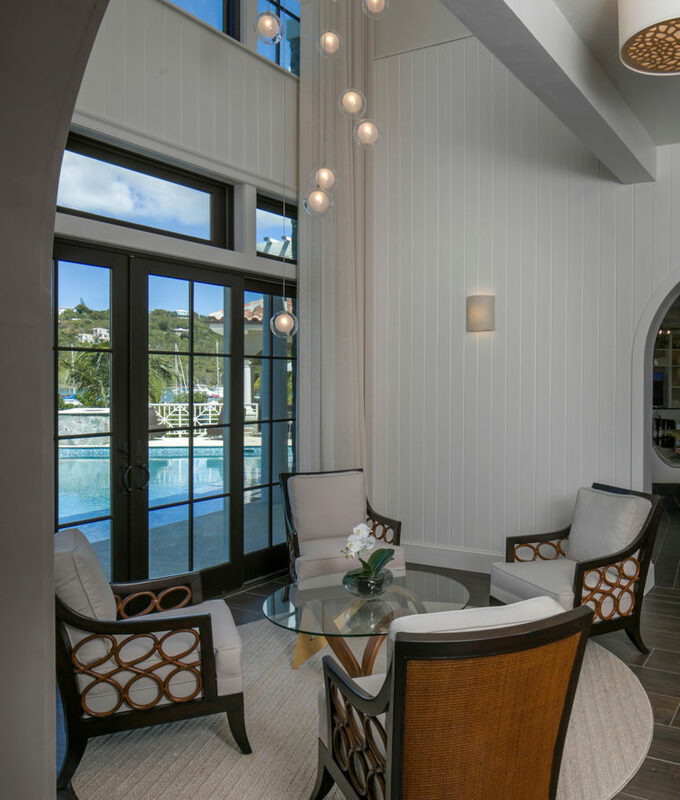 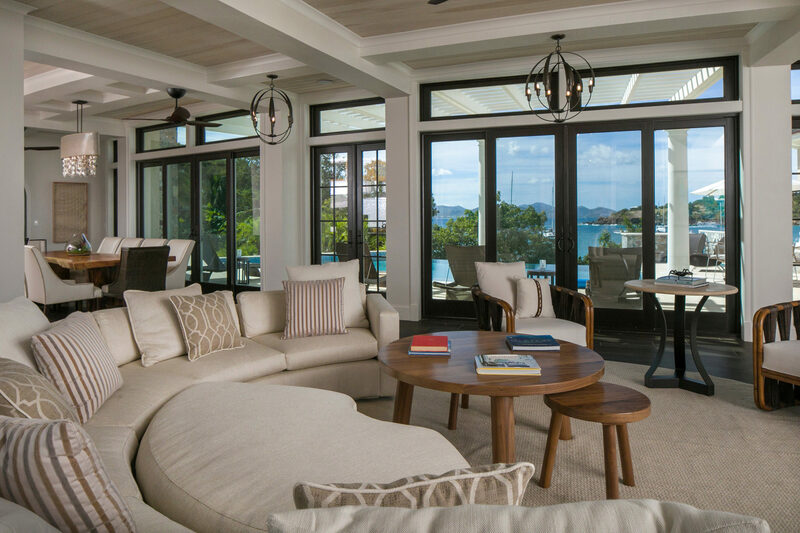 The beauty of natural light to illuminate a double height space is the centerpiece of this lounge area. 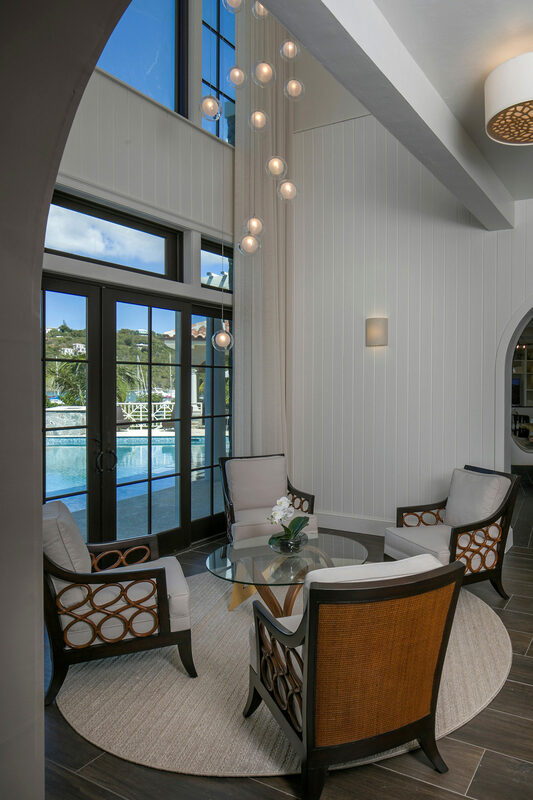 At night, a soft glow is emitted from the orbs of the Shakuff chandelier that descends 20 feet from the ceiling. 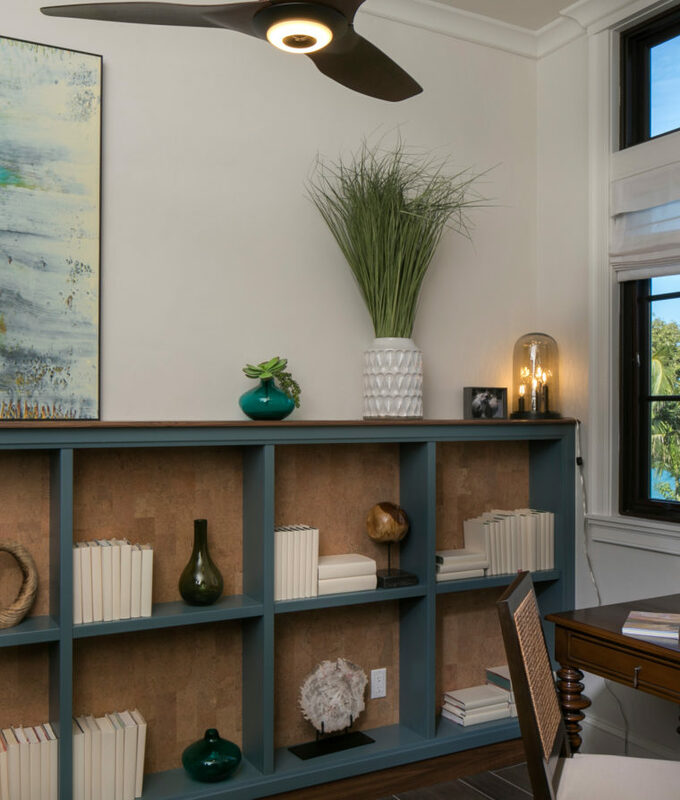 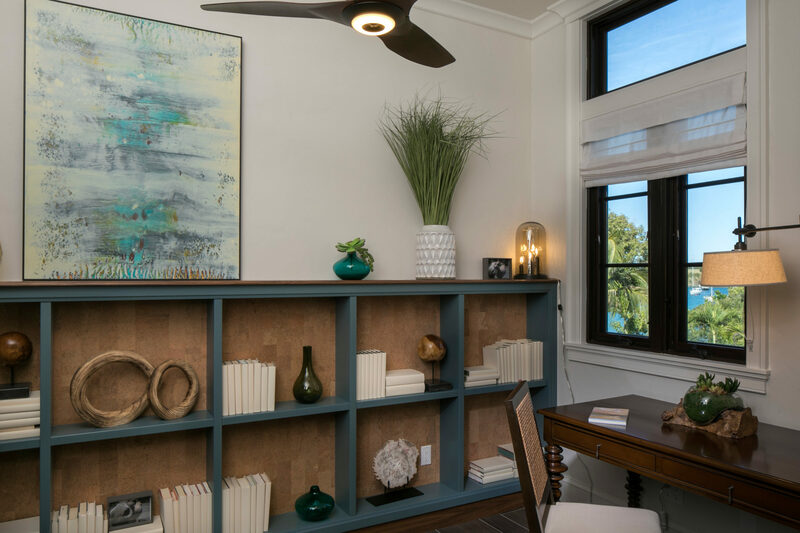 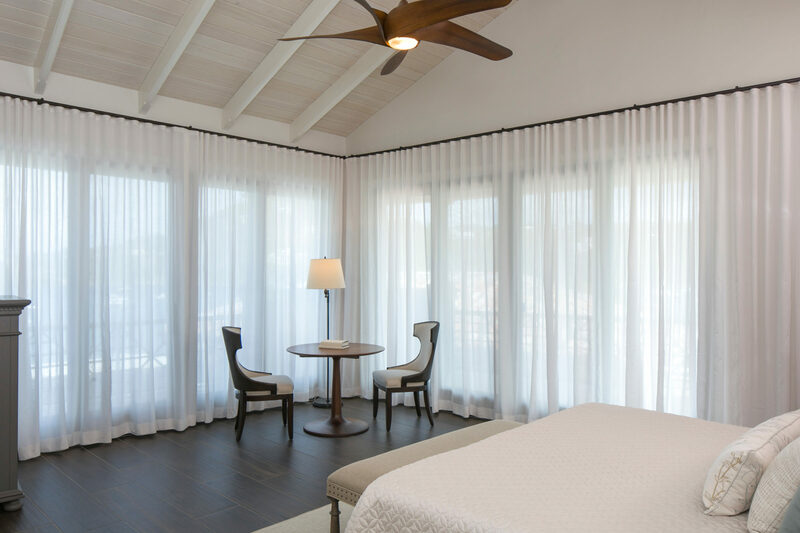 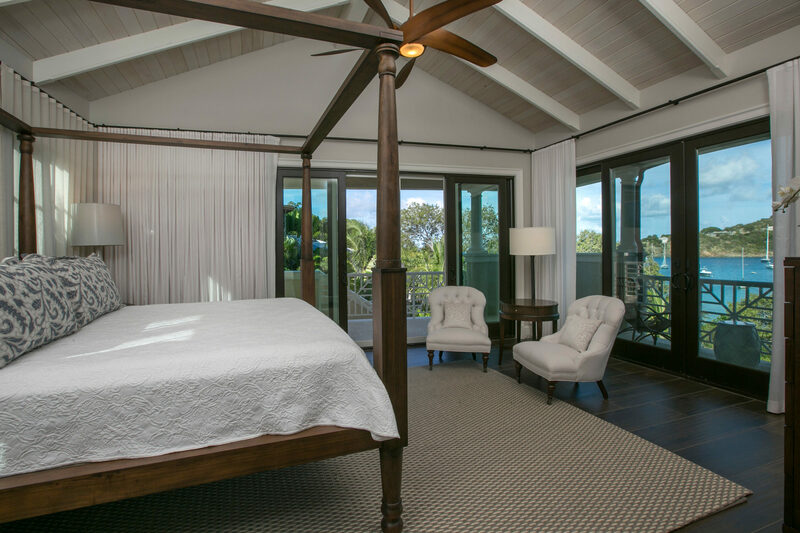 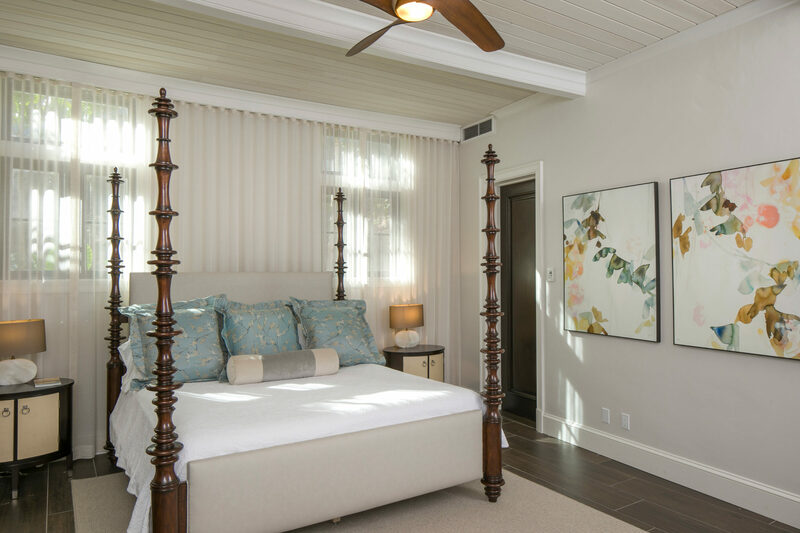 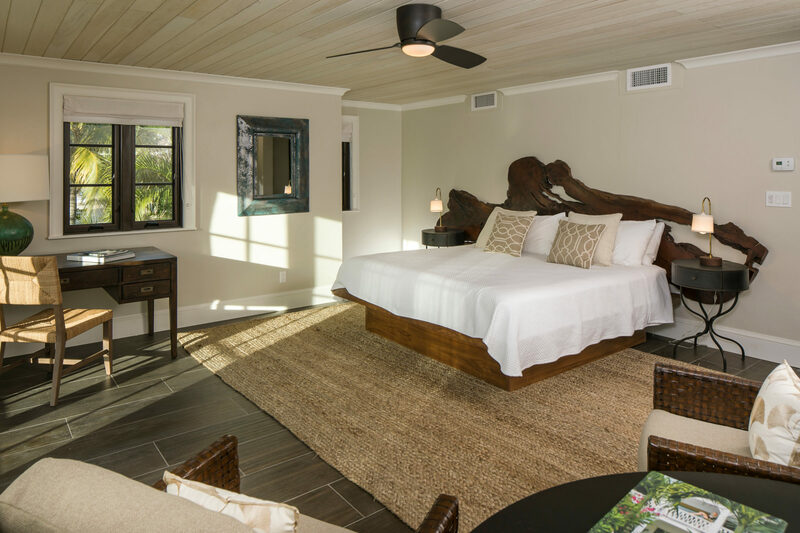 In the bedroom above, the organic design of the Minka Aire ceiling fan provides a gentle breeze while taking in the steller views from the Lee Industries tufted lounge chairs. 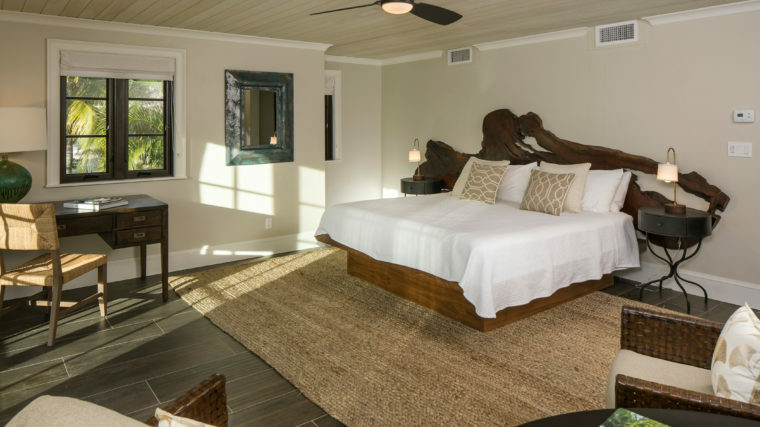 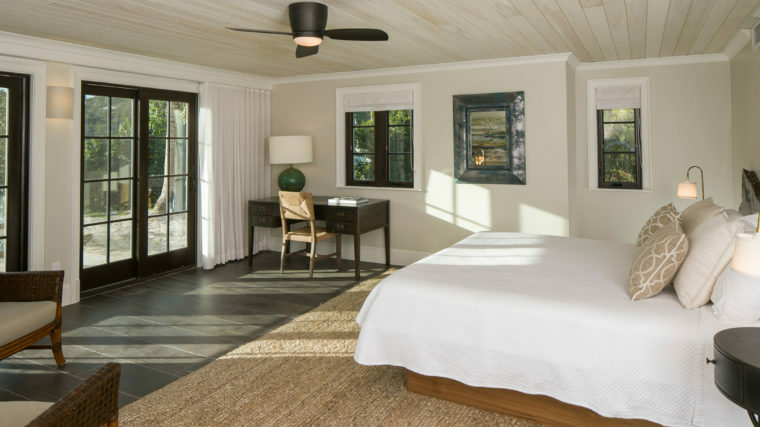 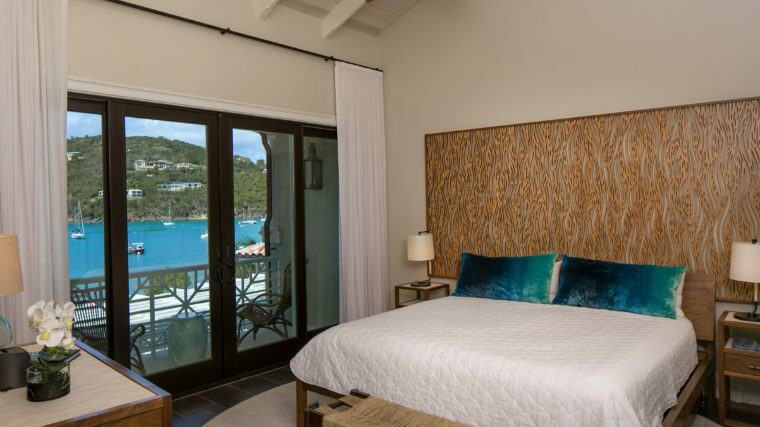 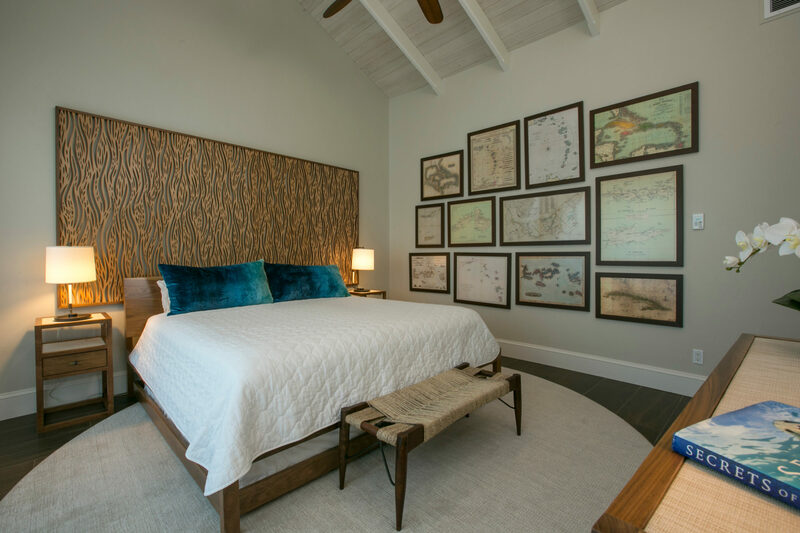 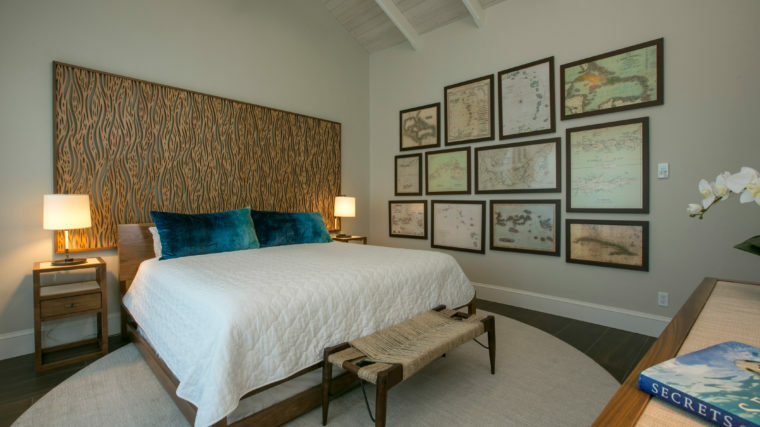 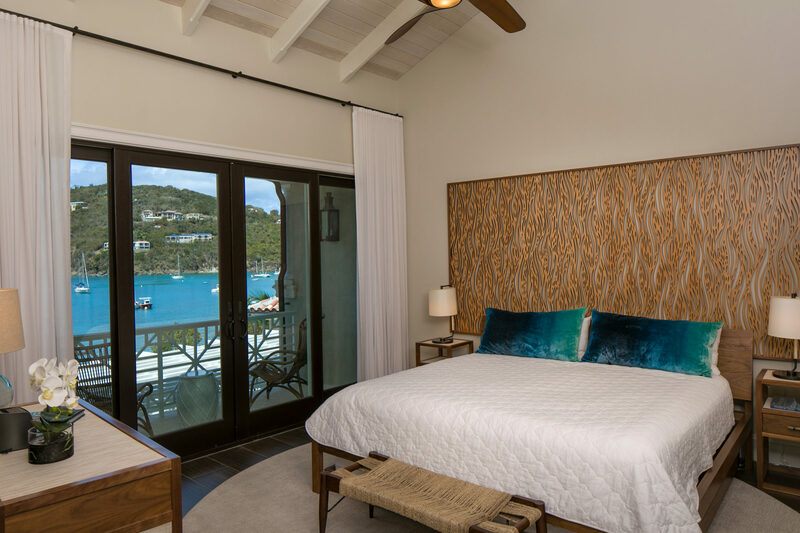 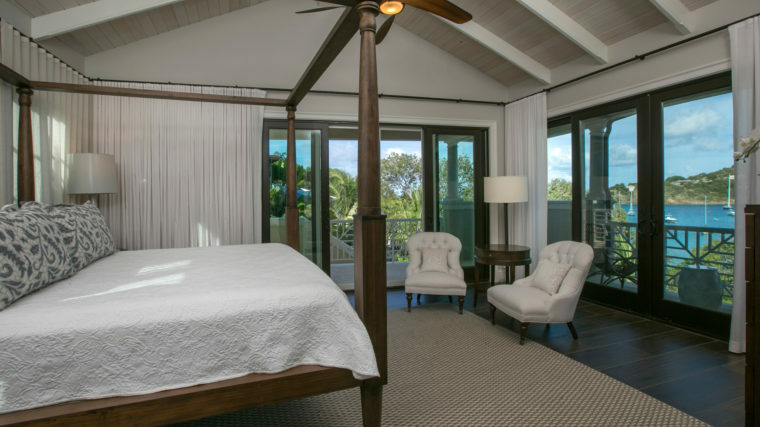 Morgante Wilson Architects designed this bedroom with the serenity of island views in mind. 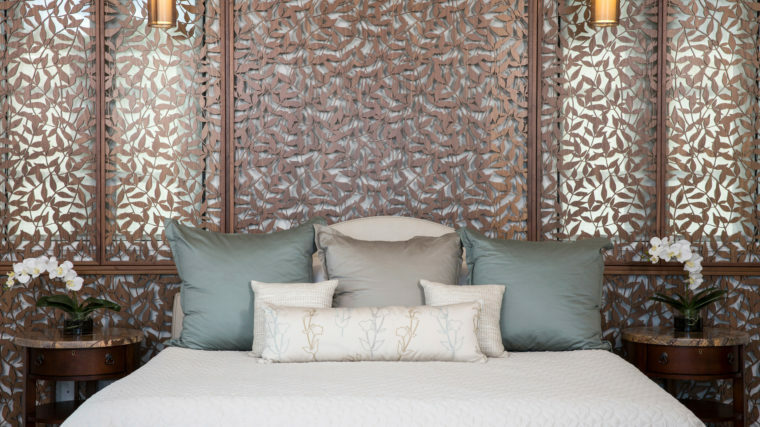 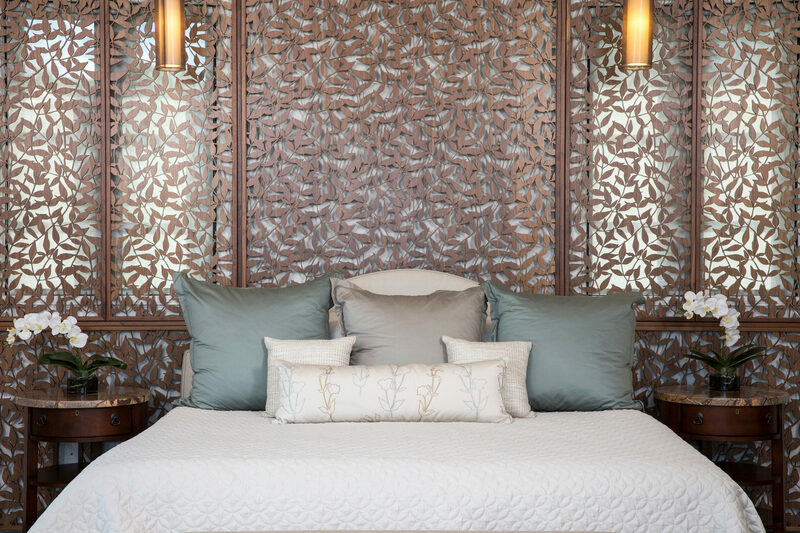 The subtle organic pattern of a Lightwave Laser wall screen creates an inviting space and bedding from Eastern Accents provides a setting for luxurious relaxation. 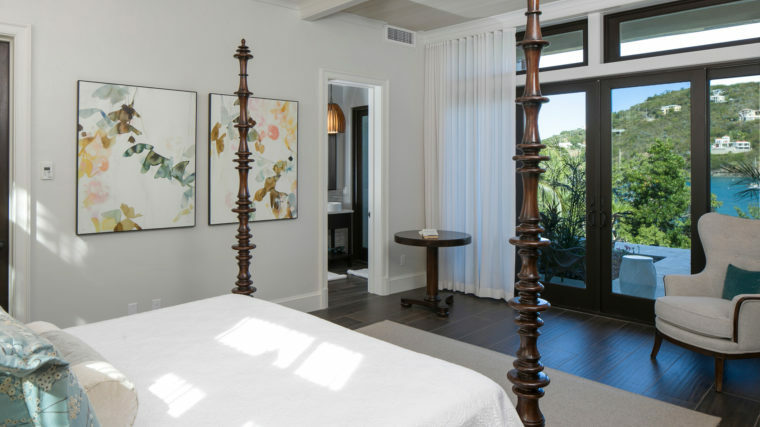 Pickled cypress lofted ceiling adds to the dramatic views and drapery by Primo Interiors allows for a private serene retreat from the everyday. 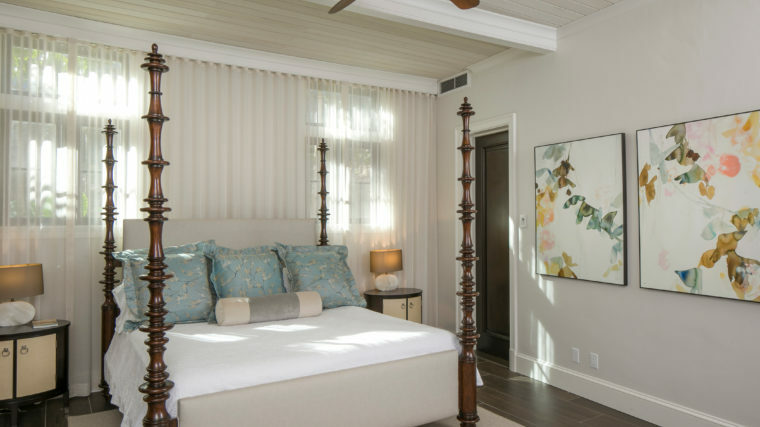 Morgante Wilson Architects designed this bedroom with peace and tranquility in mind. 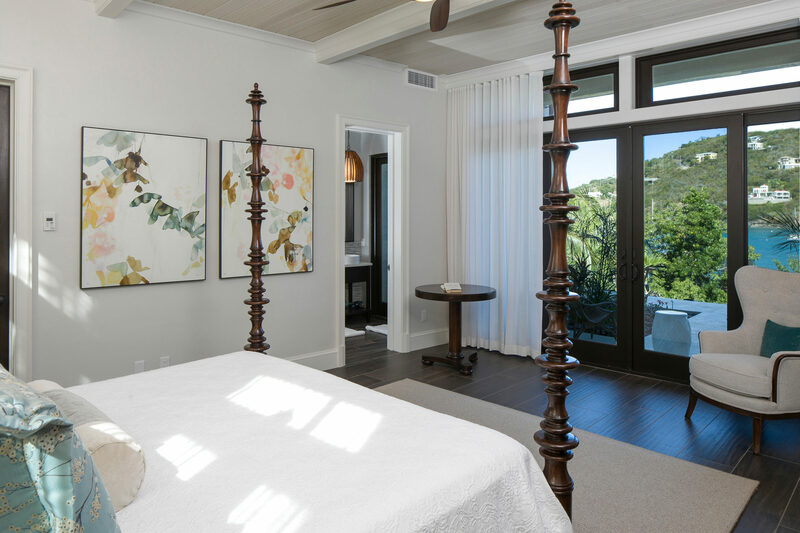 Subtle shades of cream dress the room and the four poster king bed from Emerson Bentley provides a luxurious place to rest while not interfering with the color island views that are accent by sophisticated interiors. 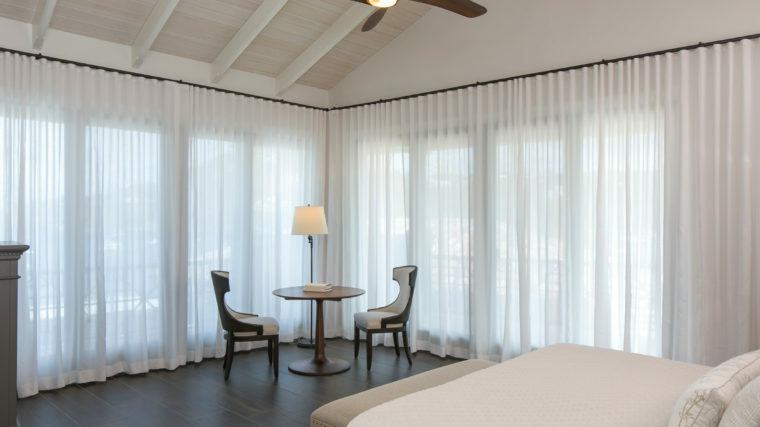 The pickled cypress lofted ceiling intensifies the dramatic views and drapery by Primo Interiors allows the bedroom to be a for a private retreat for the occupants. 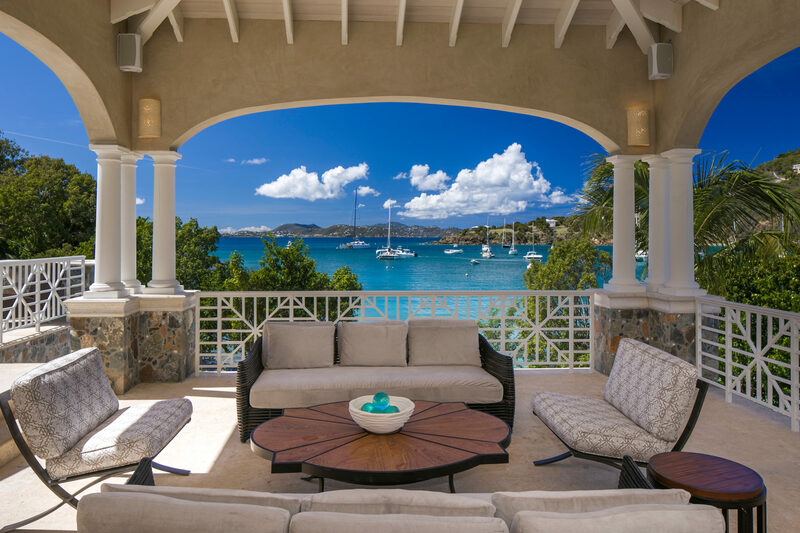 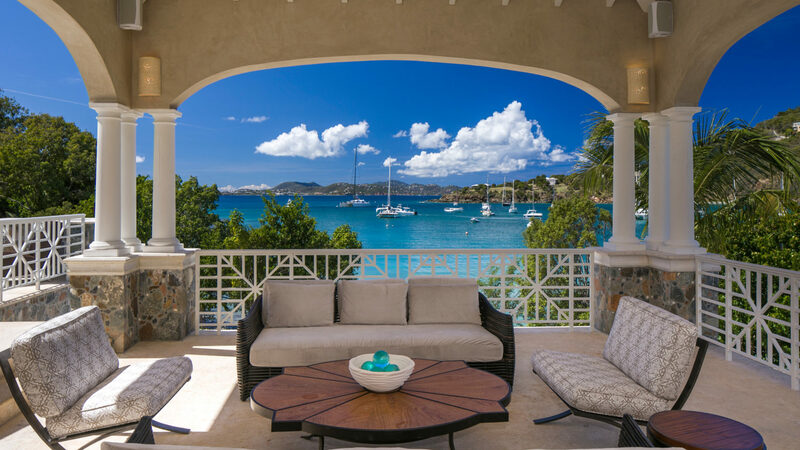 An attached Cabana was designed to be airy and open with elegant elliptical arches frame the dramatic views of the ever-changing bay as well as glorious sunsets that signal the end of a relaxing day. 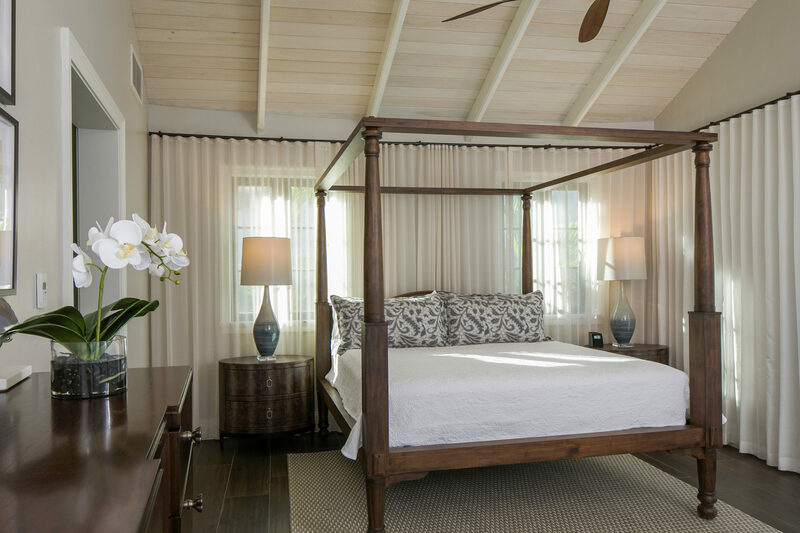 Outdoor comfort was achieved with selections from Casa Acanto, Season Living and Kreiss.